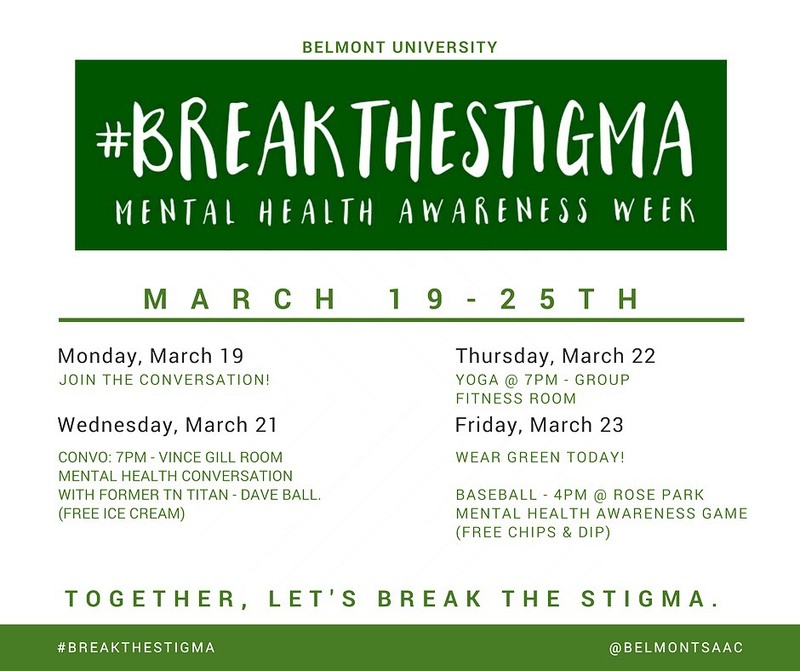 Belmont’s Student-Athlete Advisory Committee (SAAC) is working to #breakthestigma through their creation and implementation of this week’s Mental Health Awareness Week, a week of events aimed at bringing the Belmont community together in the push to de-stigmatize mental health. Over the past few years, mental health has become a major topic in the NCAA given an increase in tragedies related to mental health struggles. SAAC’s “Break the Stigma” campaign seeks to change the cultural understanding of mental health by changing the conversation. Thursday, March 22, 7 p.m.: Join SAAC for yoga! Friday, March 23, 4 p.m.: Men’s Baseball vs. UT Martin will be the Mental Health Awareness Game! Wear green all day to show your support! Through Mental Health Awareness Week, SAAC wants Belmont to know that there is power in numbers. “Together, we have the power to Break the Stigma,” Ivanchich said.